A pterygium (from the Greek, pterygos, “little wing”) is a wing-shaped, vascular, fleshy growth that originates on the conjunctiva and that can spread to the corneal limbus and beyond. Pterygia are relatively common in the general population and typically follow an indolent course, with changes in appearance but little effect on vision and the eye itself. Because early pterygia are usually asymptomatic, there has been little research on their natural history and treatment, and most ophthalmologists commonly consider them an insignificant problem until the lesions encroach on the visual axis. A pinguecula is a yellowish patch or bump on the conjunctiva, most often on the side closest to the nose. It is a change in the normal tissue that results in a deposit of protein, fat and/or calcium. Pictured: Pterygium, a red wing stretching from the conjunctiva nearing the visual axis, and Pinguecula, yellowish bumps on the conjunctiva. 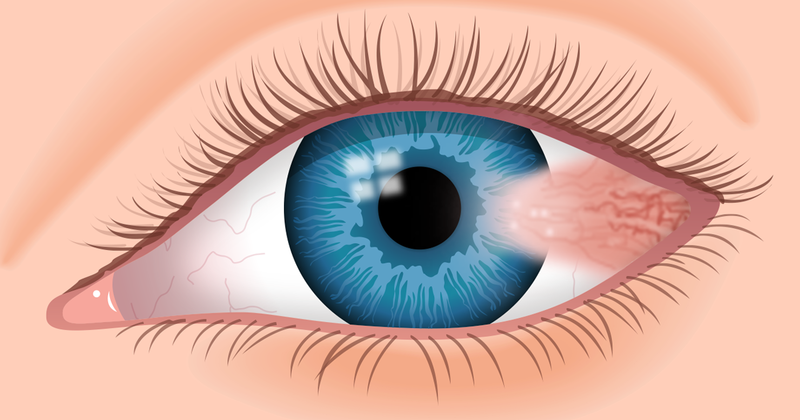 Early in the disease process, pterygia are usually asymptomatic; however, there can be signs of dry eye (such as burning, itching or tearing) as the lesion causes irregular wetting of the ocular surface. As the disease progresses, the lesion increases in size and becomes more apparent to the naked eye and may become cosmetically unpleasant for the patient. Further growth may cause visual symptoms due to induced astigmatism or direct encroachment onto the visual axis. Early in the disease process, we often take a conservative approach, limiting therapy to lubricating medications. If the lesion grows, surgical intervention becomes more compelling. If aggressive pterygium behavior is exhibited, a more aggressive surgical approach is appropriate. A pterygium larger than 3 mm may induce some astigmatism, and intervention may be warranted in such a case. Lesions larger than 3.5 mm (more than halfway to the center of the pupil in a typical cornea) are likely to be associated with more than 1 D of astigmatism and often cause blurring of uncorrected vision. We favor removing these lesions before they cause too much astigmatism or scarring in the visual axis. A conjunctival autograft technique has recurrence rates reported to be lower than the bare sclera technique in several prospective studies. Our technique involves obtaining an autograft with stem cells, usually from the inferotemporal bulbar conjunctiva, and gluing the graft to reduce postoperative inflammation and scarring. Amniotic membrane grafting has also been used to prevent pterygium recurrence. Although the exact mechanism by which the amniotic membrane confers its beneficial effect has not yet been identified, most researchers have suggested that it is the basement membrane that contains factors important for inhibiting inflammation and fibrosis and promoting epithelialization. A distinct advantage of this technique over the conjunctival autograft, however, is the preservation of bulbar conjunctiva. Mitomycin C is an anti-metabolite that can be helpful in cases of atypical or recurrent pterygium. 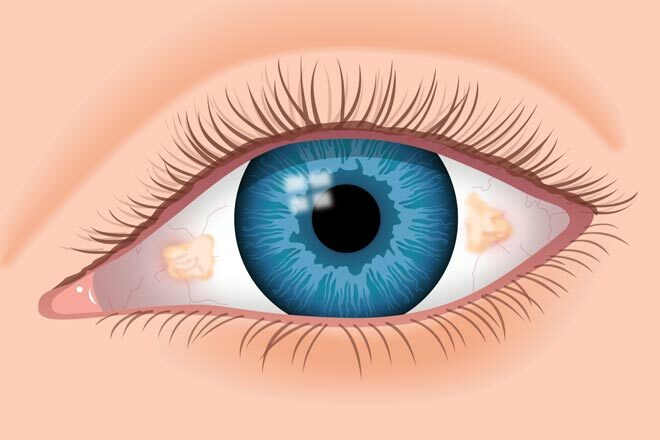 In rare cases, pre-cancerous or cancerous lesions can also grow across the conjunctiva and cornea. The use of Mitomycin C has been shown to significantly reduce the risk of recurrence / progression of these lesions. Modern techniques have led to greatly improved outcomes for these lesions. After examination of your growth, we can devise a plan that best suits your needs. For more information on Pterygium and Pingueculae, see our Patient Education Brochure, Here. 1 Krachmer, J. H. et al. Cornea, 2nd ed. (Philadelphia: Elsevier Mosby, 2005), 1481. Dr. Pramanik is a great doctor. Made me feel at ease. Office is easy to access; staff is friendly and efficient; office environment is quiet. Doctor is soft spoken and gentle in manner while providing clear and comprehensive explanations of what he is doing and why. Staff also explains everything they do.